If I had to wear one tone of blush for the rest of my life, it would be peach. I adore the subtle glow it gives my complexion and the Too Faced Papa Don't Peach blush is my favourite peach blush. The formula of the blush is sheer and ever so slightly glistening to really make this look like a kiss of colour on your cheeks. I am always fearful of over applying blush, so the sheer texture works for me as I know I can build the colour and have control over what I'm applying. 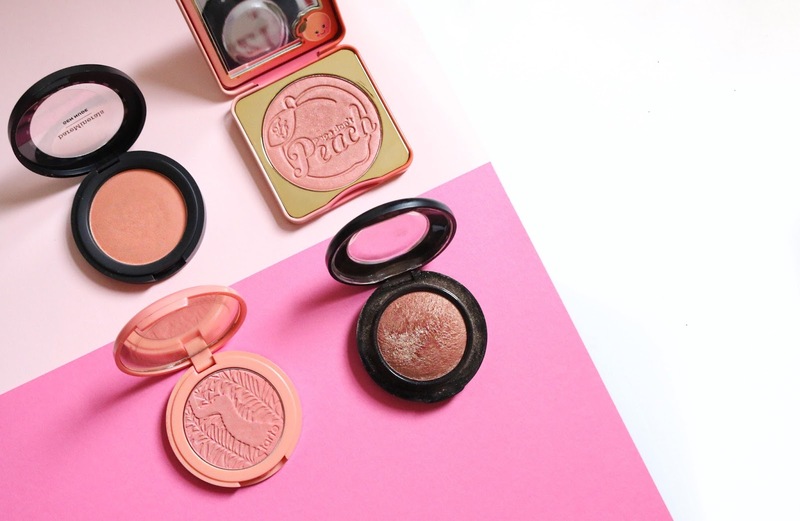 As well as being gorgeous in colour and texture, the Papa Don't Peach blush smells insane. When I apply it, the scent on peaches wafts over me which is an extra treat on top of an amazing quality product! When I'm looking for a blush which oozes sultry seduction, this is my go to. The deep rosy, brown shade is absolutely stunning and gives a smouldering wash of colour over my cheeks. Love Joy is my go to on date night or a night out as it is super glamorous and sculpting, which I adore. As this blush is on the darker side, the application needs to be sheer but buildable, which this is. It ticks all of my boxes in terms of texture and longevity, I know this will be my ride or die for a long time! I couldn't help myself but throw another peach in my blush favourites. But in contrast to Papa Don't Pesch, this Bare Minerals blush is extremely matte and deeper in colour, almost a terracotta shade. The matte finish of the blush makes for a solid and stunning saturation of colour, so a little product really does go a long way. I actually love this colour to wear on its own without a contour, it's strong enough to be worn alone and still subtly sculpt the cheeks. This gorgeous matte pink really is as pretty it looks. I tend to steer clear from pink blushes, but this shade has me hooked. The blush is a bright pink with a slightly peach undertone to it. This is my absolute favourite on holiday or in the height of summer. The blush is highly pigmented and blends seamlessly into the skin, making for a stunning natural glow. The blush promises 12 hours of long wear, and it really is as good as it claims to be. I know I can rely on this for a flawless look from dawn until dusk.